The Cairn Terrier is most famous as the dog in the Wizard of Oz. 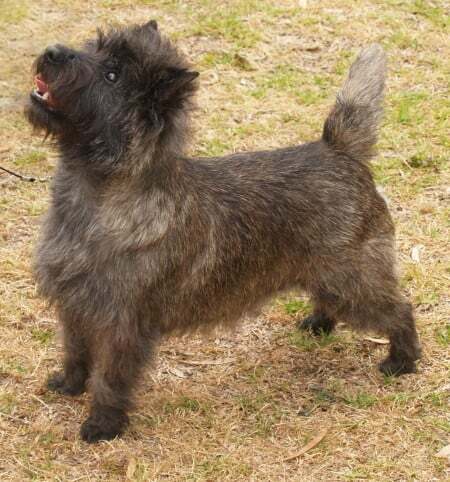 He originated in the Isle of Skye and the Scottish Highlands as one of three breeds but became the Cairn Terrier in the early 1900s. The word “cairn” means the rocks that badgers and foxes live in. The Terrier would squeeze down the cairns to trap the animal and then bark for his owner to come and kill it. This dog performs well in agility, obedience, tracking and terrier trials. He’s an active, alert dog with a strong instinct for chasing small animals and digging holes so owners need to keep this in mind. His tough outer coat is resistant to the weather and needs regular brushing. He also needs lots of exercise to keep him happy. His coat can be any colour but white. He stands around 10 inches tall.